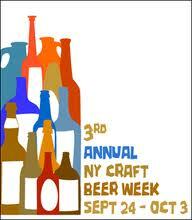 3rd Annual New York City Craft Beer Week. This week long event has grown to feature hundreds of events at dozens (maybe hundreds?) of beer bars and regular bars alike all across the five boroughs of New York City. The focus of the week of course is the craft beer itself, made from all over the United States and the World by skilled and creative master brewers who hone and express their craft at our favorite breweries. The beers we will be drinking have spent hours, days, weeks and months in the brewing process, all for a chance to be featured on such a massive scale as the New York City Craft Beer Week.